throughout her 12-hour shifts. When he woke after months in a “twilight sleep,” he revealed that during that time there was one voice that provided him comfort and relief: his nurse’s voice. Sharon’s voice. After his father’s death from cancer, Alioune Kotey felt the calling to become a registered nurse, to give others the kind of care and comfort he gave his father in those last painful days. When a patient who reminded him of his father arrived in his ward, Al’s emotions bubbled to the surface. He allowed himself a moment to cry before pushing through and returning to care for his patient. Al was thrilled to learn months later that his patient’s cancer had gone into remission. These are two of the 101 moving and inspirational stories in Chicken Soup for the Soul: Inspiration for Nurses (Chicken Soup for the Soul Publishing, LLC; Amy Newmark and LeAnn Thieman; July 21, 2015, 978-1-61159-948-0, $14.95). Most nurses didn’t choose their careers because of great hours, pay and working conditions! They felt a calling, and this book celebrates them—for the patients they heal, the lives they touch, and the fortitude with which they work long shifts, selflessly nurturing others with their hands and their hearts. did in 2001 and 2007. I think that Chicken Soup for the Soul Inspiration for Nurses is a wonderful book especially for any nurses in your family or that you know. In true Chicken Soup for the Soul fashion, the book is an anthology of 101 short stories. The stories are enlightening and inspiring. Whether you are a retired nurse, current nurse, or thinking about becoming a nurse, I really think that this is a perfect book to read. Of course, others will also appreciate Chicken Soup for the Soul Inspiration for Nurses as after all, we all rely on the wonderful help of a nurse from time to time in our lives. 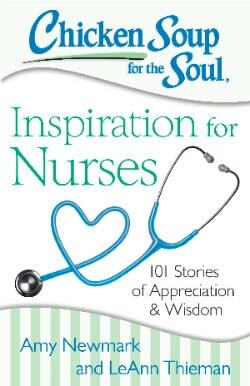 You can find Chicken Soup for the Soul Inspiration for Nurses in your local bookstore or online at Amazon. You can find our more about Chicken Soup for the Soul and all their products here….